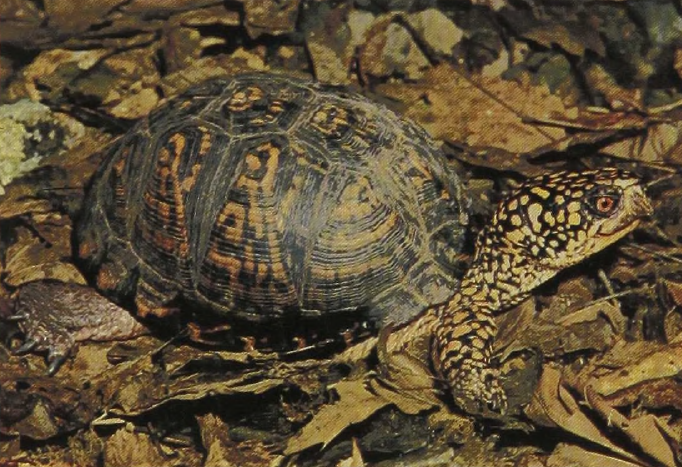 The North American Box Turtles look like tortoises and are most closely related to pond turtles. The carapace is high-domed and the plastron is beautifully hinged. The shell may close so tightly that not even a blade of grass can be inserted. The group ranges across the eastern and central United States into northern Mexico and is quite common in certain areas, its survival over this wide but only partially occupied zone may reflect such reptilian specialization as sperm storage, which permits successful reproduction at very low population densities: females may produce several clutches of eggs after only a single mating. There is little question that specimens live to be 100 years old and females are supposed to be still capable of producing offspring at 50.